The 4-circuit protection valve isolates the individual circuits of the air pressure braking system from each other. Protection of pressure in the intact braking circuits is thereby ensured if one or more brake circuit fails due to pressure loss. A total failure of the brakes is thus prevented. The 4-circuit protection valve is also responsible for supplying compressed air to the four braking circuits. The compressed air is distributed in a specific order. The two brake circuits for the front and rear axles are supplied with the necessary operating pressure first. Only then follows the supply to the circuits for the handbrake and auxiliary equipment (e.g. the pneumatic suspension). This ensures that the parking brake can only be released when both service brakes are operational. DT® Spare Parts brand 4-circuit protection valves are made of well matched materials which ensure reliable operation as well as a long service life. 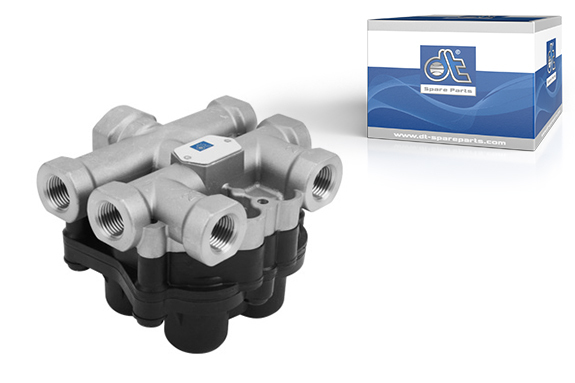 Furthermore, DT® Spare Parts 4-circuit protection valves are subjected to a leakage test. The accurately fitting connectors ensure unproblematic installation. In addition to all standard 4-circuit protection valves, the comprehensive DT® range also includes a variety of repair kits.